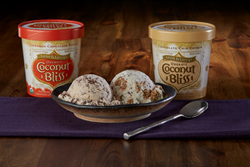 Bringing their flare for organic, high quality ingredients to divinely creamy dairy-free ice cream, Coconut Bliss introduces two new tempting pint flavors. Luna & Larry's Coconut Bliss coconut milk ice cream. Dairy-free, soy-free, gluten-free and certified organic. Chocolate Chip Cookie and Cinnamon Chocolate Fusion will appeal to lovers of classic desserts or those seeking a treat with a little kick. Chocolate Chip Cookie and Cinnamon Chocolate Fusion will appeal to lovers of classic desserts or those seeking a treat with a little kick. The new organic, dairy-free flavors will be available in select natural food markets across the US beginning in the Spring of 2016. As with all of the company’s products, the new Chocolate Chip Cookie and Cinnamon Chocolate Fusion are certified organic, dairy-free, soy-free, gluten-free and Non-GMO Project verified. They also feature Fair Trade dark chocolate that is crafted in an allergen free facility. Chocolate Chip Cookie: A classic indulgence that will please even the choosiest of customers. Chewy, gluten-free oat and hemp seed cookies are swirled in divinely creamy, dairy-free vanilla ice cream loaded with melt-in-your-mouth dark chocolate flakes. This flavor for the ages is made new again with certified organic ingredients and fair trade chocolate. Featured Ingredients: Gluten-free sprouted brown rice flour and gluten-free sprouted oat flour; Hemp seed, a superfood containing 8 essential amino acids and the ideal ratio of omega fatty acids; and Fair Trade dark chocolate. Cinnamon Chocolate Fusion: A spirited embrace of warm cinnamon and rich chocolate. This sweet-spicy and exceptionally creamy ice cream provides an intriguing backdrop for the smooth dark chocolate flakes. Offering complexity and depth of flavor, it will delight refined and adventurous palates alike. Featured Ingredients: Sustainably harvested Indonesian cinnamon powder (Cinnamon Burmanii) which contains manganese, fiber, iron, calcium and stimulates circulation; Cinnamon oil extract; and Fair Trade dark chocolate. Bliss Unlimited, LLC was founded to create a satisfying ice cream without the health and ecological impacts associated with dairy, soy, or gluten. Coconut Bliss® is The Evolution of Ice Cream®. Certified organic and Non-GMO Project verified, Coconut Bliss® is made with cholesterol-free coconut milk that is packed with lauric acid and medium-chain triglycerides (MCTs), and sweetened with naturally low-glycemic agave syrup. The company values ecological and social sustainability, and is committed to using organic and ethically produced ingredients of the highest quality. Privately owned and based in Eugene, Oregon, Coconut Bliss® has been operating since February 2005. For more information visit coconutbliss.com.